ROTHMANS 81` – Whitbread/Volvo Ocean Race Round the World. BUILDT FOR WINNING WHITBREAD ROUND THE WORLD RACE 1989/1990! NOW BARGAIN SALE PRICE 2 MILL. Originally built by Paragon Composite as ‘Rothmans’ for the 1989/90 Whitbread Round the World Race (the forerunner of the Volvo Ocean Race) where she finished fourth. Rothmans originally sailed with a crew of up to 16 people and it took 131 days to complete the 33,000 nautical mile course. 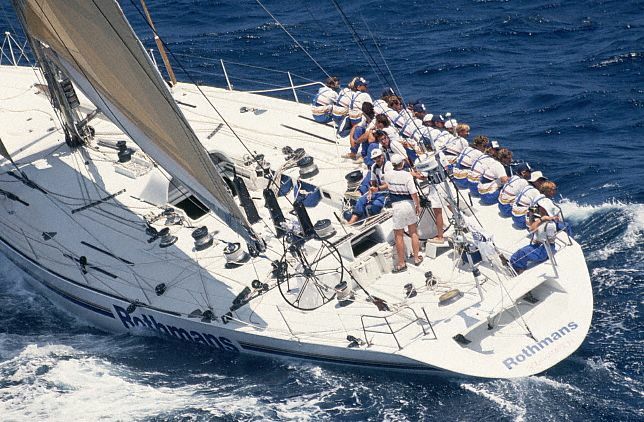 Since finishing The Whitbread, Rothmans has been kept in pristine condition by present owner Bob Erixon in Scandinavia, who successfully campaigned her in 2003 winning the Round Gotland race and finishing up the order in other Scandinavian regattas. 4th ÅF Offshore Race – round Gotland 2015. This 1989 Humphreys 81ft Kevlar/Carbon/Epoxy fractional sloop Maxi Racer benefits from a full refit in 2011 and new Cummins 4BT 150hp engine in 2014. She offers an ideal corporate platform or classic maxi potential. She is in original and fantastic condition and has been continuously maintained. Apart from some new electronics and sails, she is in her original racing trim down below. She benefits from being recently fully faired and painted including hull and topsides, new sails (1,5 mill. ), continuous upgrading of the navigation instruments over the past 4 years and much more. Company owned by 15 people. Located in the water in Saltsjöbaden in Stockholm. Please contact the Yachtbroker / Yachtmegleren Stian Sandlie + 47 92467000 / Mail: stian@yachtmegleren.no for more information. We have exclusive sales rights directly with the owners. If you are looking for something else, we will be happy to find your next boat of your dreams. If you have a boat to sell, please let us sell it for you, based on No cure – no pay. The accommodation is built as an open area. The forward section of the cabin is fitted for sail stowage with head and shower compartment. Astern of mast is a tools/stowage area for deck gear and spare parts. There are a total of 20 adjustable pipe berths including four removable pipe berths in fore peak. Amidships is the main hatch, galley and the navigation station aft of it. Pressure water system to galley and head. Water heater which runs through the engine and 220V shore power. Full Brookes & Gatehouse Hercules 2000 Race equipment (Log, wind instrument, depth sounder). MaxSea electronic chart display software Time Zero with tidal/currents and weather routing modules and AIS. Updated 2011. Incl. charts: Sweden-England-Med-West Indies-USA. Seagran 818CS long wave and FM radio with recorder. All grinders are cross linked and can be directed to one or all of the Linkable winches. 8 personnel AIS Beacon. 2011. Fire extinguisher system: to classification standard. Hull and deck made of carbon and Kevlar fibers vacuum bagged epoxy plastic with PVC core.